A traditional artisan technique for creating hand dyed textiles, ikat or ikkat (both pronounced ee-KAHT) is a process where the yarn is tightly tied in small sections to create a resist and then dyed to create the desired pattern before it is woven. After the dying is complete, the yarn is woven into a textile. A detailed and intricate process, some ikats are made by dying the warp, some by dying the weft, and still others by dying both – a highly advanced crafting process termed double ikat. Characterized by bold patterns with imperfect edges due to the nature of the technique, ikat fabrics have been cherished for centuries. The fuzzy or blurry quality of the design is telltale distinction due to the virtual impossibility of binding, dying and then lining up the pre-dyed yarns with perfect precision. 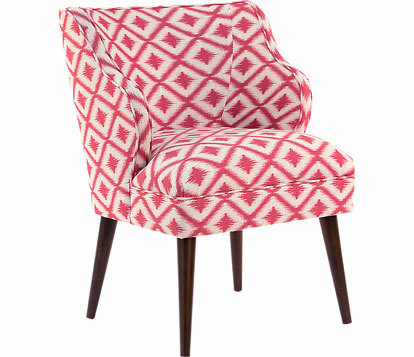 This distinctive quality the design gives ikat prints unique warmth and rich hand-crafted quality that designers are crazy about. Modern manufactures have found ways to emulate these designs without the painstaking process, making ikat-inspired prints more available and affordable. To determine if a fabric is “real” handmade ikat or ikat-inspired, look at the back of the fabric, handmade ikat will always have the pattern on both sides because the dying happens before it is woven. Additionally, each handmade ikat piece will have unique imperfections, all shapes will be slightly different in size, the pattern will not repeat precisely and so forth. You can find ikat designs in all shapes, sizes and colors. We’ve seen it on rugs, accent chairs, toss pillows, wall art and even bed linens. These traditional patterns can give your room a contemporary global, upscale bohemian or handcrafted artisanal look. 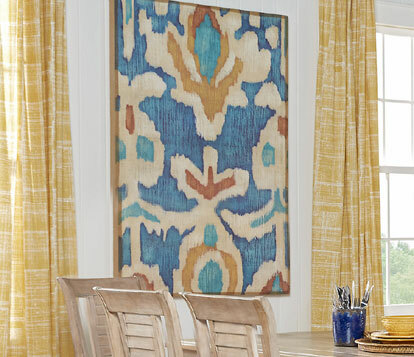 Very commonly found in rug prints, ikat designs bring color and texture to any room. 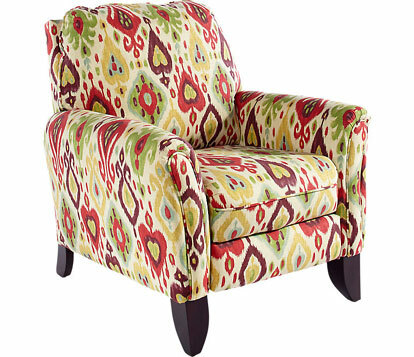 Accent chairs can be an excellent way to introduce color and pattern to a room. Ikat designs can be single color and simple designs or multiple shades in complex designs. Multiple shades of similar pattern can be sprinkled throughout your space on accent chairs and accent pillows to create a coheasive look. 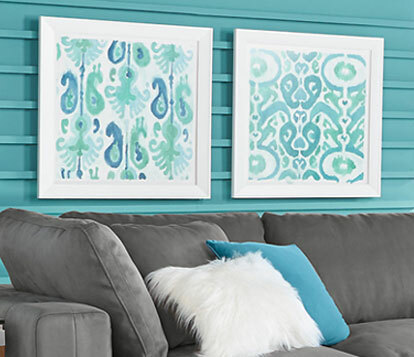 Wall art can be created by stretching ikat fabrics like a canvas and attached to wood frames or they can be painted or printed to echo the ikat style patterns. Ikat patterns tend toward loose, organic shapes. Typically designers use them sparingly as an accent to the room and they pair well with more structured patterns in coordinating shades.